In Chrome, the automatically generated selection for new tabs is really practical. Still, you can customize the homepage in the browser for quick selection and other functions. 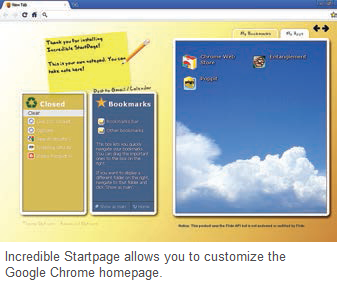 A free Chrome extension called Incredible Start page helps you conﬁ gure your Chrome homepage. You can customize Chrome to your liking with the free Incredible Start page extension, which you can easily ﬁnd online. Once you reach the extensions page, conﬁrm the installation and allow access to personal data by clicking ‘Install’. Now open a new tab. To the left, you will see a list of the last closed tabs as well as the bookmarks. To the right, the large ﬁeld of ers a quick selection for a speciﬁc folder of bookmarks. To change the displayed contents, navigate to the desired bookmark folder, and click ‘Show as main’ button at the base of the dialog. Other bookmarks can also be added to the right via drag-and-drop. You can personalize colors and the background image by clicking ‘Theme Options’. To use your own picture, click ‘Custom’ under ‘Wallpapers’. In the next dialog box, enter the URL of the desired photo and conﬁrm with ‘Save’. You can also use photos from Flickr as a background. You can add notes for quick access on the yellow notepad that you can send to G mail or to Google calendar with the allocated links. With the ‘Advanced Options’ link, you can change the number of the recently closed tabs that should be visible on the page in the ‘Maximum recently closed tabs’ combination ﬁ eld.